Florentine architect and sculptor. 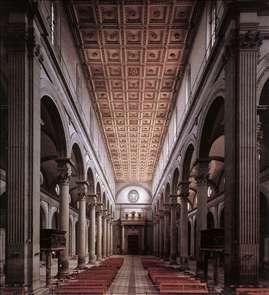 He was one of the most famous of all architects - a Florentine hero on account of the celebrated dome (1420-36 he built for the city s cathedral - and one of the group of artists, including Alberti, Donatello, and Masaccio, who created the Renaissance style. 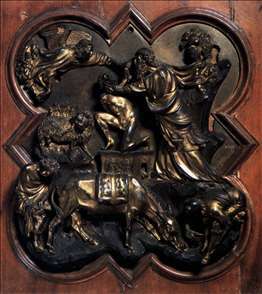 He trained as a goldsmith and was one of the artists defeated by another great goldsmith/sculptor, Lorenzo Ghiberti, in the competition (1401-02) for the new Baptistery doors for Florence Cathedral; both competition panels are in the Bargello. 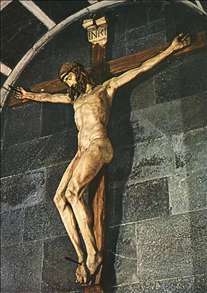 The disappointment of losing is said to have caused Brunelleschi to give up sculpture and turn to architecture, but one important sculptural work of later date is attributed to him - a painted wooden Crucifix in Santa Maria Novella (c. 1412). 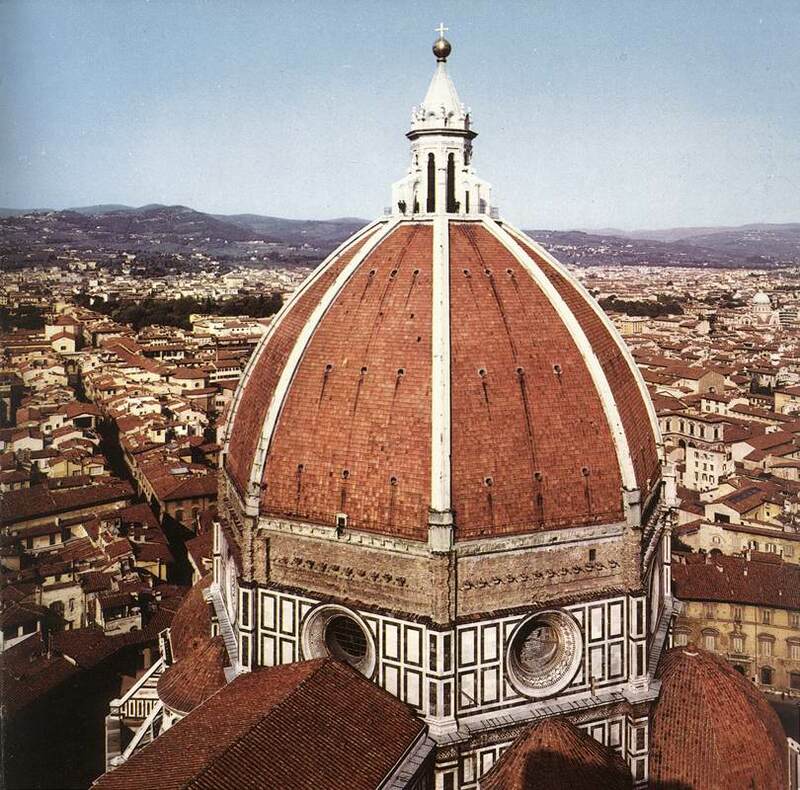 In 1418 Brunelleschi received the commission to execute the dome of the unfinished Gothic Cathedral of Florence. The dome, a great innovation both artistically and technically, consists of two octagonal vaults, one inside the other. Its shape was dictated by its structural needsone of the first examples of architectural functionalism. 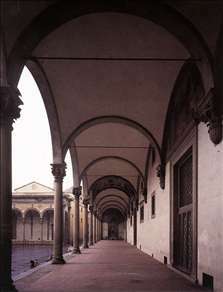 Brunelleschi made a design feature of the necessary eight ribs of the vault, carrying them over to the exterior of the dome, where they provide the framework for the dome s decorative elements, which also include architectural reliefs, circular windows, and a beautifully proportioned cupola. This was the first time that a dome created the same strong effect on the exterior as it did on the interior. 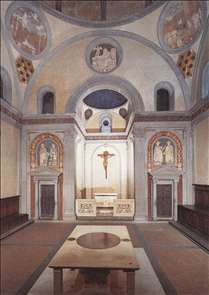 In other buildings, such as the Medici Church of San Lorenzo (1418-28) and the foundling hospital called the Ospedale degli Innocenti (1421-55), Brunelleschi devised an austere, geometric style inspired by the art of ancient Rome. Completely different from the emotional, elaborate Gothic mode that still prevailed in his time, Brunelleschi s style emphasized mathematical rigor in its use of straight lines, flat planes, and cubic spaces. 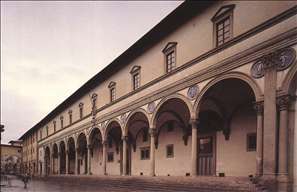 This wall architecture, with its flat facades, set the tone for many of the later buildings of the Florentine Renaissance. 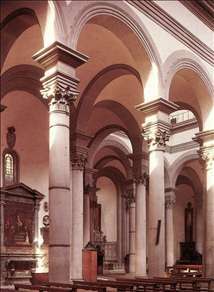 Later in his career, notably in the unfinished Church of Santa Maria degli Angeli (begun 1434), the Basilica of Santo Spirito (begun 1436), and the Pazzi Chapel (begun c. 1441), he moved away from this linear, geometric style to a somewhat more sculptural, rhythmic style. In the first of these buildings, for instance, the interior was formed not by flat walls, but by massive niches opening from a central octagon. This style, with its expressive interplay of solids and voids, was the first step toward an architecture that led eventually to the baroque. Although he was not a painter, Brunelleschi was a pioneer in perspective; in his treatise on painting Alberti describes how Brunelleschi devised a method for representing objects in depth on a flat surface by means of using a single vanishing point. See more details about "Old Sacristy"
See more details about "The nave of the church"
See more details about "Dome of the Cathedral"
See more details about "Façade"
See more details about "Loggia"